Preparation time: 5 minutes (when using frozen cooked shrimp). Cooking time: about 12–15 minutes. Coat a cool, nonstick wok with cooking spray. Preheat wok, then add oil. When the oil is hot, add shrimp and cook until they turn pink. 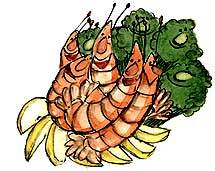 (If using precooked shrimp, add shrimp during the last minute of cooking). Remove shrimp from the wok and set aside. Place frozen broccoli in the wok and cook for 3 minutes, stirring constantly. Add corn with peppers, onion, hot pepper sauce, and Cajun seasoning. Cook 2 minutes more, stirring frequently. Add tomatoes and cook until hot and bubbly, about 3 minutes. Add cooked shrimp and heat 1 minute more, stirring frequently. Serve immediately (over hot rice and with a squeeze of lemon if desired). Exchanges per serving: 1/2 starch, 3 vegetable, 4 very lean meat. Carbohydrate choices: 2 1/2.